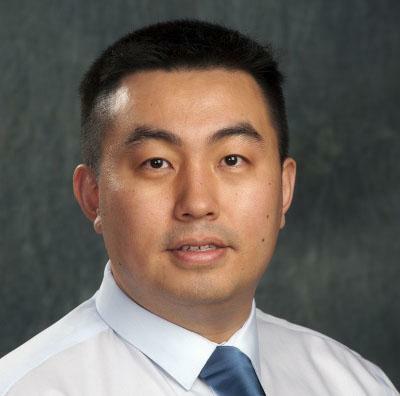 David Zhang won the Best Poster Paper Award at the 2015 IEEE Conference on Electrical Performance of Electronic Packaging and Systems (EPEPS), held October 25-28 in San Jose, California. A Ph.D. student in the Georgia Tech School of Electrical and Computer Engineering (ECE), Zhang was honored for his poster paper entitled “Reduction of PDN Induced Coupling into Signal Lines Using PTL Power Distribution,” which was co-authored by ECE Professors Madhavan Swaminathan (who is also Zhang’s advisor) and David Keezer. A conventional power delivery network (PDN) uses power planes to carry current from the power supply to various loads. However, in this paper, the authors have demonstrated through measurement that such PDN is highly susceptible to electromagnetic coupling from signal lines that are routed either as microstrip lines or lines that go through the printed circuit board (PCB) through via transitions. This PDN will then, in turn, couple unwanted energy to other parts of the system, leading to signal and power integrity degradation. Recently, a new PDN topology was proposed to utilize transmission lines to deliver power to the loads, hence the name power transmission line (PTL). This innovative idea comes from the Georgia Tech Mixed Signal Design Group, led by Swaminathan, and is currently investigated by Zhang. Due to the geometry and routing flexibility of PTLs, the investigators have shown through measurement that the PTL-based PDN can provide wide-band (200MHz-5GHz) and better isolation than the conventional PDN designs in both the microstrip line and via-transition cases. As an example, in the via-transition case, which is a very common practice in PCB designs, the PTL provides -40dB or better isolation while the conventional designs have a worst-case isolation that reaches -10dB. The PTL-based PDN can be used in applications such as modern high speed I/O systems and RF and mixed-signal designs that require high signal fidelity, low noise, and good signal to PDN isolation.